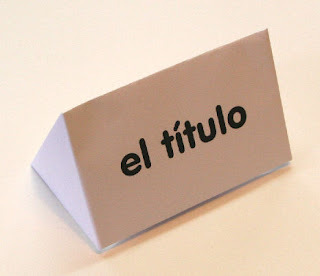 Here are some simple folds which create stable name cards for table placement and title cards for display models. They are both made from A4 or American letter-sized paper. In deference to my many Spanish speaking readers I have labeled the examples in Spanish. Hola mis amigos. My many Brazilian followers will wish to translate these as "O Nome" and "O Titulo" respectively. Olá pessoal! 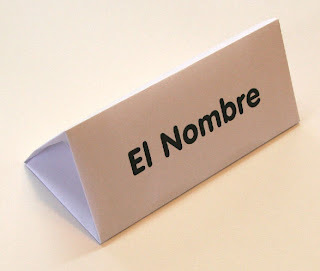 The dotted crease marks at the top and the bottom of the Crease Pattern for the Name Card are lightly folded marker creases which do not extend into the space reserved for writing (or printing) the name. They are there so that the side hems can be folded accurately. The model is completed by tucking the side hem at one end into the side hems at the other end. This forms a triangular shape with the floor being the only section showing the marker creases. This is a very stable model. 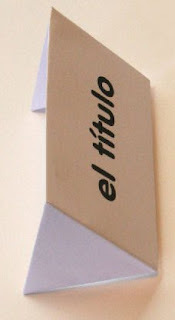 The Title Cards are commenced by marking the center on the short side with a short light crease before folding the piece in half in the other direction (lengthwise). Now make a cupboard by folding the short edges into the center. The top and bottom quarters shown on the Crease Pattern will now crease themselves as you crease the topmost sheets (which is why these creases are shown in a lighter color). Next, mark the diagonals on the sides. I have only shown these on one of the quarter sections. 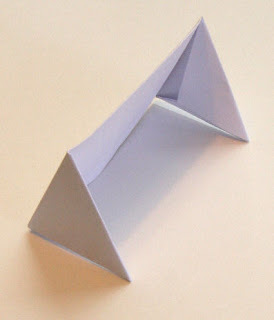 You can fold them on both if you wish, or else copy the sharp folds onto the other side by folding the layers together. You should have triangular points on both ends made by two side flaps. Tuck the shorter one into the longer one on both sides. (See the photo of the back of the card for an example.) 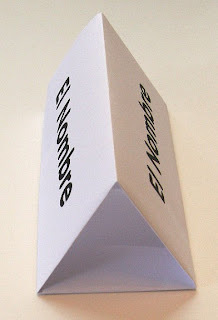 The resulting model should now slant at an appropriate angle for reading when placed on a table. Adjust the sides and the angle as you wish by folding the back triangles inwards or outwards.